Deciding which is the best Hawaiian Island is an integral step in planning your trip to the Hawaiian Islands. The word best is subjective, of course, as each island has its own unique charm and personality. It’s also worth noting that while many people visit just one island, others choose to do a little Hawaiian Island hopping and see even more. That said, we understand that planning a Hawaiian vacation can seem like a daunting task, and deciding which island to visit should be fun. That’s why we want you to head over to our Which Hawaii Island to Visit page, take the quiz, and get your personalized results- how simple is that! You may also want to check out Selecting the Best Hawaiian Island, which will give you more of the lay of the land, so to speak, plus an array of facts and quick stats about each island. After you’ve taken the quiz, come back here and get an even better idea of what each island has to offer. If Oahu garnered the most points on your scorecard then you're probably someone who enjoys the big city, fine accommodations and dining, and the general atmosphere that comes with the hustle and bustle of city life. Honolulu is the 11th largest city in the US and is probably where you'll spend a lot of your time. Oahu has the best selection of both cultural and historical sites in the islands, including good museums. This island is an excellent place for water sports, and the beaches are sure to please. People just love Oahu, and it lives up to its nickname of the "Gathering Place." Want to learn more about Oahu? Just visit our Oahu Guide, Oahu Accommodations, or Oahu Tours & Activities sections. A lot of folks say Maui no ka oi which means "Maui is the best." Whether or not your scorecard shows this, Maui is a fine location for almost all visitors to the islands. It's the middle ground between the big city on Oahu and the country life of Kauai and the Big Island. A lot of folks choose Maui as their honeymoon destination, and many love the large selection of condos available here. The Hana Highway is one of the world's premier driving attractions and Haleakala, one of Hawaii's National Parks, is an incredible place to visit. And everyone from golfers to windsurfers will find plenty of adventure on Maui. Maui's nickname is the "Valley Isle," and when you arrive, you'll see why. Haleakala to the east and the West Maui mountains to the west - incredible! Want to learn more about Maui? Just visit our Maui Guide, Maui Accommodations, or Maui Tours & Activities sections. If the Big Island topped your list, we don't blame you. It's our favorite, too- and for good reason. The Big Island is by far the most diverse of all the Hawaiian Islands, and it's BIG. In fact, it's the size of all the other islands COMBINED! From barren grasslands to lush jungle, and from lava fields to snow-capped mountains - it's all here. Plus, it's the only island where you can literally walk on land younger than you are! Kilauea is still erupting and often puts on quite a show for visitors where lava enters the ocean. The Big Island offers a solid selection of world-class resorts on the Kohala (Gold) Coast, condos all around the island, and excellent B&Bs in both Kona and near the Volcano area. The Volcano area is a great place for birdwatching, too. The Big Island also is bustling with activities- from hiking to a recent lava flow or riding horseback in the gorgeous Waipio Valley. Want to learn more about the Big Island of Hawaii? 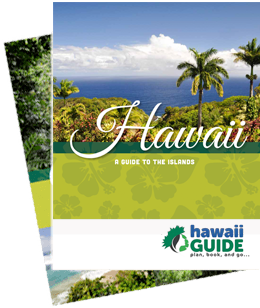 Just visit our Big Island Guide, Big Island Accommodations, or Big Island Tours & Activities sections. If you like all things green, like seclusion, and love to hike - OK, if you're into nature... welcome home! Kauai offers up pure paradise to anyone who loves the great outdoors. Kauai is the oldest of the major Hawaiian Islands and has certainly earned its nickname of the "Garden Isle." Beautiful flora and fauna abound around the island. As the oldest Hawaiian Island, Kauai is also home to some of the world’s best beaches. But what really sets Kauai apart is that the bulk of it can't be reached by car. That means grab your hiking pole and hit the trails! Kauai offers what we believe are the best hiking trails in Hawaii; from the beautiful coastal Kalalau trail on the NaPali coast to a hike inland to see Waialeale's "weeping wall," you can't beat the hiking on Kauai. The Garden Isle is also home to Waimea Canyon, which Mark Twain called the "Grand Canyon of the Pacific." Kauai is definitely a more romantic island, as well. The only downside for many is the weather, as all things green means lots of rain. But don't let that worry you- Kauai is an incredible island to visit; our personal second favorite in the chain. Want to learn more about Kauai? Just visit our Kauai Guide, Kauai Accommodations, or Kauai Tours & Activities sections.